face shapes | All About Jewelry! Whats appealing to my eyes? Do I want colored gem stones or diamonds? What outfits / accessories compliment me? What sort of activitives am I going to be involved in? When developing a jewelry style its important to have confidence in your personal clothing style. Such a confidence is necessary because it provides an increase in creativity which makes choosing a jewelry accessory very simple. Its also important that the environment whether indoor or outdoor is considered when choosing a piece. The right piece will be comfortable, compliment your style, and appealing to your eyes. As a rule of thumb, it’s usually best to purchase the best quality and affordable basics then add on other pieces later. Such basics are: In Gold chain necklace, Classic hoop/button earrings, and bracelet. Shapes that compliment a variety of outfits. Begin with classic shapes that look appropriate with a variety of outfits, and then add pieces that offer versatility of wear or a fashion touch, such as different colors or finishes. For instance, your height and bone structure play a big role in determining the kind of jewelry that looks best on you. A smaller, petite woman would be better served with necklace lengths that fall below the breast but above the waist to elongate her figure. Meanwhile, a tall, thin woman may want to select a choker that cuts the line of the neck and de-emphasizes her height. And a full-figured woman should stay away from jewelry that’s too small or delicate. 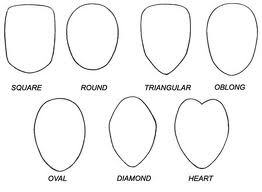 The few basic face shapes are oval/oblong, round, rectangular and heart-shaped. If your face is oval, triangular-shaped earrings are especially flattering. A round shape should seek elongated, dangling styles that draw the eyes down, rather than around. A rectangular face, try jewelry that adds width, camouflaging the length of the face. Finally for heart-shaped faces, look for earrings that are wider at the bottom, because style can soften a pointed chin look. What type of hand do I have? If you’re long-fingered, wider bands will look especially good on you. If you’re short-fingered, thinner bands and stone shapes such as marquise or pear that elongate the hand would be a good choice. Anyone with additional advice/comments feel free to drop a line.